I'm not sure if pasta carbonara falls just above or just below fettuccini alfredo on the "not great for you" scale, but I do know that it's delicious - and a little goes a long way, so you don't have to feel too guilty. This dish has the perfect combination of salty and sweet, creaminess from eggs, and good texture from the pasta and bacon. In this recipe video, I show you how to make a pasta carbonara, that will blow your socks off. In my video, I don’t use peas, but I have seen them in several other versions, and have absolutely no objection to them. For pasta carbonara there are only a few things you really need to worry about. Like all pasta dishes, you need to make sure you don’t overcook the pasta. To get the perfect al dente, I start checking the pasta a few minutes before the suggested cook time labeled on the box. And generally take the pasta out of the water about a minute before the suggested time. Slice the strips of bacon into quarter inch pieces and cook until the fat is rendered out and the bacon is crispy (see bacon lardons video). You can do this ahead of time. 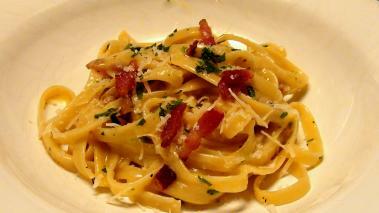 The pasta carbonara is now ready to serve, you can garnish with a bit more of the bacon, parsley or cheese if desired. Enjoy! !